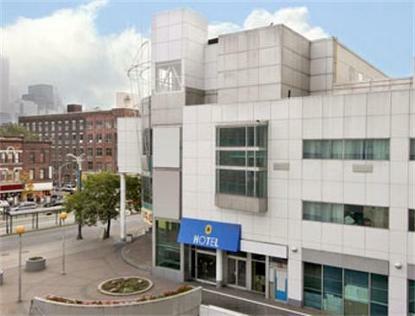 The Super 8 Hotel in Toronto, ON is a newly constructed/renovated facility located in the heart of Chinatown. Located within walking distance from entertainment, shopping, restaurants and much more. The hotel offers convenience and accommodations for business and leisure travelers alike.While staying at the hotel enjoy our Free SuperStart Breakfast (served fresh daily), Free High Speed Internet Access and workout/gym facilities that are open daily. When you are ready to sit back and relax, enjoy our newly renovated oversized rooms. Amenities in all rooms include: microwave, refrigerator, alarm clock, hair dryer and expanded Cable TV. Iron/Ironing board is available upon request. For those guests that travel with pets, we are a pet friendly hotel,small fee may be charged. There is paid underground parking at the hotel and other paid parking around the hotel. This hotel is a 100% smoke free facility. A valid credit card is required at check in for a minimum deposit of $100.We pride ourselves on sterling customer service and look forward to seeing you along the way.